I am hankering after some Christmas spirit. Last year I had it in abundance, this year it’s yet to appear…So I did what Nigella might do and made the most Christmassy thing I could think of. It worked! 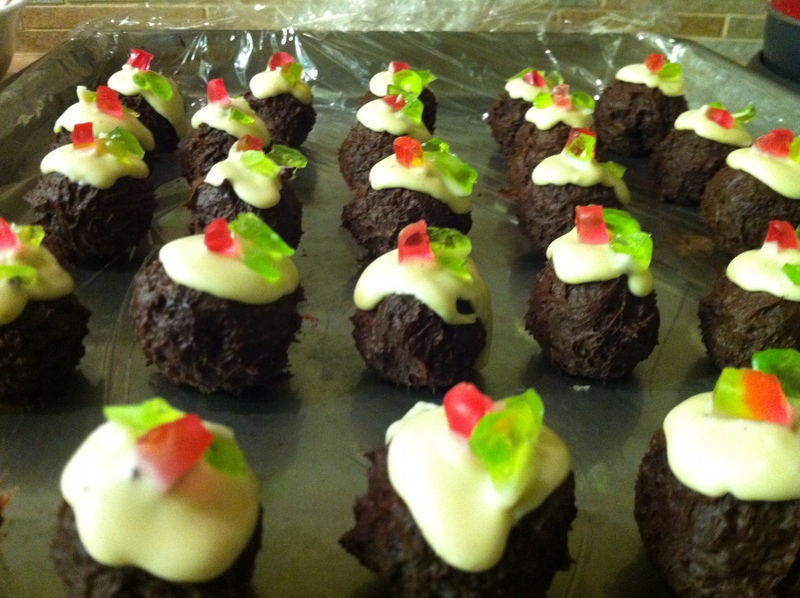 Well, I’m at least 50% more Christmassy than I was before I made these mini Christmas puddings, aka Nigella Lawson’s Christmas Puddini Bonbons from her ‘Nigella Christmas’ book. They are so easy to make, just mix all the ingredients together (adding the melted chocolate last) then roll lumps of the mixture between your palms to form small balls and pop in the fridge to firm up. When they’re less gooey decorate with melted white chocolate and the red and green glace cherries. I couldn’t find green glace cherries or angelica so I bought some of those red gummy strawberry penny sweets and used the green for the holly leaves and the red for the berries. Maybe I should have this Nigella sampler on my kitchen wall for inspiration? What food gets you in the Christmas spirit? Thanks Yvette :) There’s still time to buy a Christmas cake & just do the fun decorating of it, that might get the Christmas spirit going for both of us. Have a lovely Christmas!